Explore patterns and uncover insights when policymaking using Power BI. 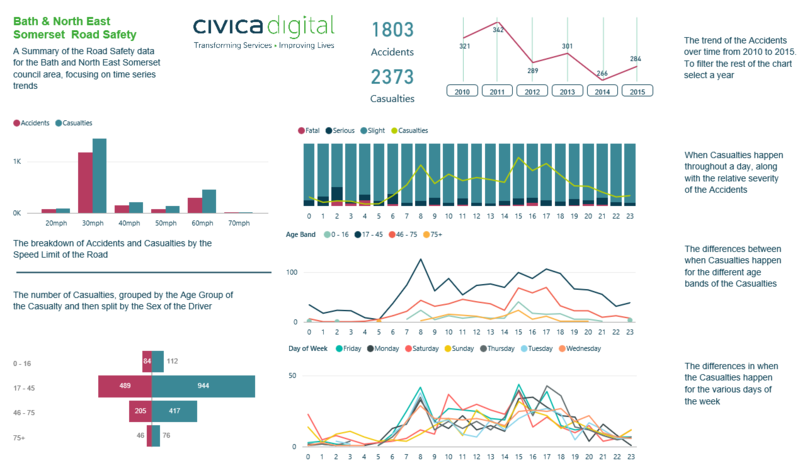 This example visualises traffic collision and social data, providing understanding needed to improve and monitor effectiveness of local government initiatives. Local Authorities work with varied sets of data, both generated internally and shared by civic partners locally and nationally, which is analysed and explored to inform decision making and policymaking. 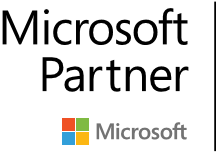 Power BI provides capability which enhances how councils make sense of data, explore trends, and discover patterns that can help them focus limited resources on activities and initiatives that can have the maximum impact on the local area. This analytical dashboard is based on the public road collision data that is published by the Department of Transport. It takes the perspective of a local council researcher, who is looking to provide an interactive summary of their findings to policy teams and councilors. 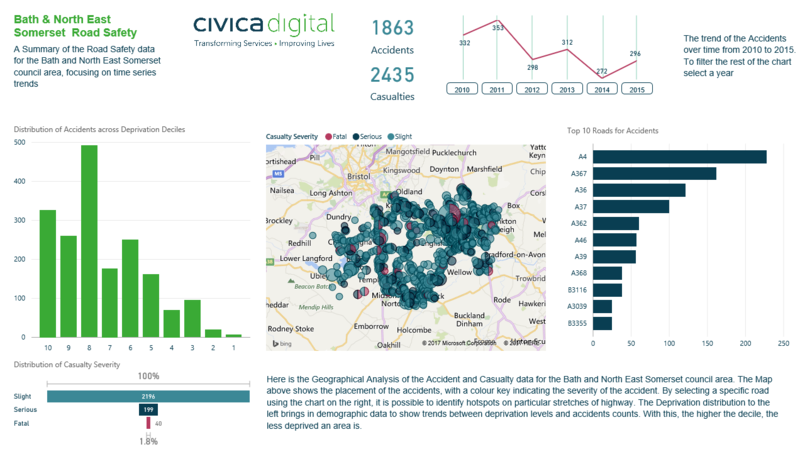 There are two main themes to the data analysis: A temporal analysis, which looks at how there have been changes over time, which hours of the day are the most likely to have accidents, and whether or not the day of the week has an impact; and a geographical analysis to look at where accident hotspots are, and allowing the user to filter by factors such as road name and speed limit. This shows the expected peaks around rush hours, but it is worth observing that the peaks are earlier in the day when looking at Child Casualties, reflecting the different travelling times. These insights may help focus resources where they can be of most benefit, for example by providing road safety information to schools and parents in an area where there are hotspots. The example dashboards highlight a key feature of Power BI, namely the ability to explore data and see the impact that different factors have on each other. By clicking on elements of the visualisations, it is possible to see how filtering down to a single factor can reveal patterns and trends across the dashboard. The dashboard also shows how easily different data sets can be combined using the modelling tools within Power BI, and how the combination of data provides a deeper understanding, to support better decision making. In this example ONS data of Deprivation rankings have been combined to see if there are patterns linking road traffic safety and social issues.